You’ll find a complete list of services that can be embedded using the URL here. 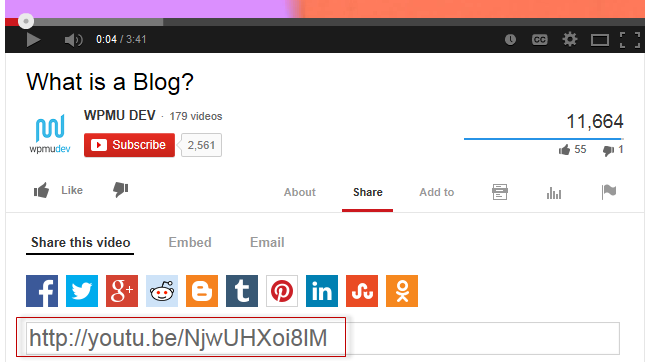 For YouTube you use the video URL from “Share this video” under the Share option. 3. Paste the URL on a line by itself in your post/page editor where you want the video to appear. 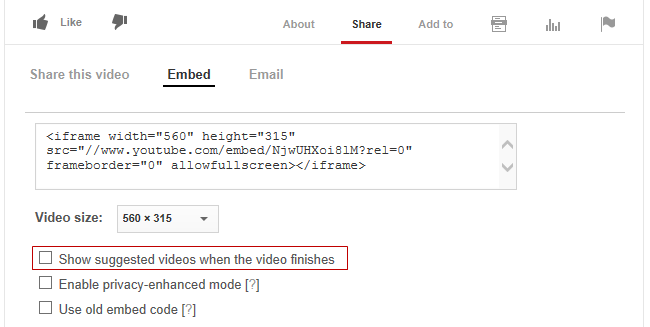 This is handy when you want to change the size of the video embed, remove related videos when embedding YouTube videos or are embedding from a video sharing websites where you can’t use the video URL (such as videos from. Ted Talks, SchoolTube or TeacherTube). 1. Locate video you want to embed. 2. Copy the embed code for the video. Websites use a range of different icons to represent Embed code. 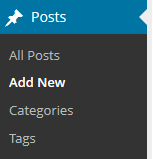 Look for icons like </>, the word Embed or hover your mouse over icons until you see the word Embed. 4. Place your cursor where you want the the video to appear and then click on the Add Media button. 5. In the Add Media window click on the Insert Embed Code tab. 6. 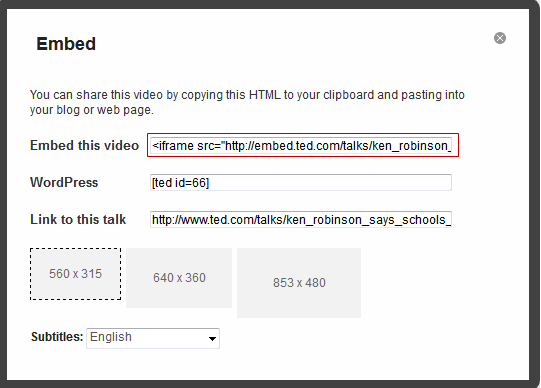 Paste the video embed code into the embed code field. 7. Click on Insert into Post. 8. Your Add Media window will close and the form will appear in the visual editor as shown below. 9. When you view your published post you will see your video. 5. Add the embed code to your post using Insert Embed Code.